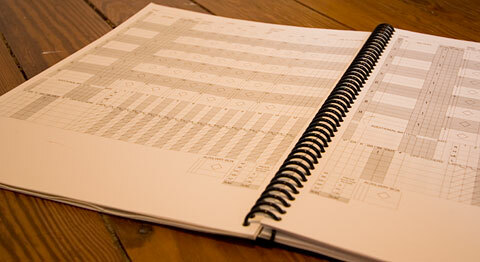 All scorebooks are hand-made and designed to withstand ballpark conditions. They feature a laminated front cover, rigid back, and spiral binding for easy on-the-lap use. The heavyweight paper ensures that your writing won't show through to the next game. Scoring instructions and quick reference page are included for convenience. Before buying, you can try a sample 9-batter or 12-batter scorecard. Blank pages of a Professional Scorebook. Sorry, but scorebooks are no longer available. Please contact me if you'd like to be notified if production resumes. If you are about to purchase a scorecard, please be sure to set your email spam filter to accept messages from reisnerscorekeeping.com. If you have purchased a scorecard and have not received an email with instructions for retrieving it, please check your spam folder. If the email is not in your spam folder, please tell me so I can help. You should receive the email within moments of completing your payment. [Reisner Scorekeeping] is so much easier to use, and it makes it so much easier to re-create events, that I have a really difficult time using a traditional scorebook now.